Our Grand Image artists are always up to creative endeavors in their local communities! 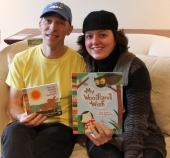 This weekend our very own Kate Endle did a book 'signing' & 'singing' with Chris “Caspar Babypants” Ballew at a book event in West Seattle on December 11, 2011. Video includes Caspar explaining how he wound up with this sideline to his rock 'n' roll career!